There is something unusual about the way the name of God is treated in the Old Testament books. The name itself sometimes appears to have an existence of its own apart from God himself. It’s natural for us to take this kind of usage as a literary personification. But is it? This post is one more update of some of the new things I have been learning as I try to catch up with scholarly studies into ancient Judaism. God does things with his name as if it were an entity “out there”. He places his name in the temple. We read that his name saves his people and is worthy of praise. 20 “See, I am sending an angel ahead of you to guard you along the way and to bring you to the place I have prepared. 21 Pay attention to him and listen to what he says. Do not rebel against him; he will not forgive your rebellion, since my Name is in him. 22 If you listen carefully to what he says and do all that I say, I will be an enemy to your enemies and will oppose those who oppose you. 24 Do not bow down before their gods or worship them or follow their practices. You must demolish them and break their sacred stones to pieces. Similarly, as we see in verse 23, this angel is said to lead the Israelites while at the same time God explains he is the one who is acting. 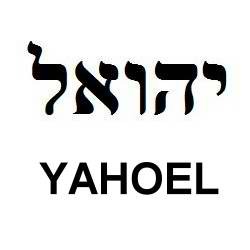 But the phrase that has attracted most attention in Jewish studies is “my name is in him”. Is this the same angel as we met ten chapters earlier? If so, the same angel has the name of God in him and also has the outward appearance of God. He is both a loudspeaker of God and a face-mask for God. 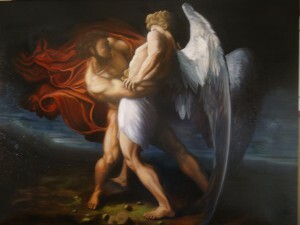 In all their distress he too was distressed, and the angel of his presence [=Face] saved them. What is most significant in this discussion is that this angel appears to be a container for the name of God. He is an ambassador or messenger for God and his presence announces the presence of God himself — by virtue of God’s name being in him. This angel is one to be feared and obeyed. He will not forgive those who rebel against him. Now the angel is not the only receptacle for God’s name. In Deuteronomy we learn that God is present in the Temple when his name dwells there. Indeed, as we read of the wanderings of Israel being led by this angel we eventually come to the time when they settle and have a stable place of worship. The wandering angel who contains God’s name is followed by the eventual resting place of that name (and angel?) in the Temple. This same angel was understood by the Jewish philosopher Philo to be God’s “firstborn Son”. For Philo a “son of God” was something that was an immediate creation of God. The intelligible world itself, being an immediate creation of God, is also a “son of God”. Presumably Philo did not think and write in isolation. Presumably his thoughts were shared by other Jews in his circle in Egypt in the first century. So we have an angel whose function is to guide and protect the people of God. This same angel is the face of God and he possesses the name of God. So what does that make the angel in relation to God? God’s face is on him and God’s name is in him. We might (with Moshe Idel) think of the face as the external aspect of God (representing the appearance of God) and the name as the internal (representing the speech or words of God). If we think of God manifesting himself in these two ways (external and internal) we find a number of interesting correspondences. Is sonship in this context also just a metaphor, nothing more than a literary figure of speech? Jon D. Levenson (The Death and Resurrection of the Beloved Son — a work I have discussed in some depth in this blog) argues that we make a serious mistake if we think so. God declared Israel to be His son. But in the same Book of Genesis we read that Jacob(=Israel) was obviously born as a flesh and blood child of Isaac and Rebekah. What Levenson reminds us of is that kinship language in those times (as it is still used among certain cultures today) could be used to describe formal relations that were not flesh and blood ties. Certain kinship relations could even be stronger than blood-ties. Political allies (e.g. Solomon and Hiram) were “brothers”; a subject king would be the son of the dominant “father” king. When we read that the birth of Jacob involved certain complications — being to aged parents; two “nations” in the womb squabbling to see who comes out first — we are being reminded that God is the one deciding the outcome. God’s claim outweighs any biological claim. When God declares Israel to be his son he is declaring his superior right to fatherhood over the biological parents. But what this point about sonship have to do with a name? The name of Jacob was changed to Israel. That suffix ‘el is the name “God”. God declared Israel to be his first-born son, and the sons of Israel to be his children (Exodus 4:22; Hosea 11:1). Another instance of this name-sonship connection is in the Dead Sea Scrolls. Great will he be called, and will be designated by his name. He will be called son of God, and they will call him son of the Most High. First his face; then he receives his name. And this name is pre-existent just as in other texts we learn that the Messiah or Wisdom or the Torah itself is said to be pre-existent — with God from the beginning. Thus in both ancient Judaism and in rabbinic material a pre-existence is attributed to the name of figures who bear the appearance (face) of God. And tread upon the earth and dwell upon it. So in sectarian writings preceding Christianity we find special significance attributed the face or appearance of God and the name of God and to figures who bear these. In the Apocalypse of Abraham (late first/early second century) we meet a heavenly figure who has great power by virtue of the ineffable name that is in him. His name is Yaho’el. 10:3 and ch. 8 – confession of — is a great power by virture of the ineffable name in him. And the angel whom He had sent came to me in the likeness of a man and grasped me by my right hand and set me up upon my feet and said to me, “Stand up Abraham, 0 friend of God who loves you; let not the trembling of man seize you! For lo! I have been sent to you to strengthen you and bless you in the name of God, who loves you, the Creator of the celestial and the terrestrial. Be fearless and hasten to Him. I am called Jaoel by Him who moves those who exist with me on the seventh expanse over the heavens, a power in virtue of the ineffable Name that is dwelling in me. I am the one who has been given to restrain, according to His commandment, the threatening attacks of the Living Ones of the Cherubim against one another, and to teach those who carry Him, the song of the seventh hour of the night of man. I am ordered to restrain the Leviathan, for every single attack and menace of every single reptile are subject unto me. I am he who has been commissioned to loosen Hades, and destroy him who stares at the dead. I have been sent to bless you now, and the land which the Eternal One, whom you have invoked, has prepared for you, and for your sake I have wended my way upon earth.. Compare the Angel who was assigned God’s name in Exodus 23:21. That angel also had vice-regal powers next to God. It is also possible to interpret this passage as God himself declaring that his name is Yaho’el. Again in this book the face and name of God play significant role. And even if there be not as yet any one who is worthy to be called a son of God, nevertheless let him labour earnestly to be adorned according to his first-born word, the eldest of his angels, as the great archangel of many names; for he is called, the authority, and the name of God, and the Word, and man according to God’s image, and he who sees Israel. I have also heard of one of the companions of Moses having uttered such a speech as this: “Behold, a man whose name is the East!” (Zech 6:12.) A very novel appellation indeed, if you consider it as spoken of a man who is compounded of body and soul; but if you look upon it as applied to that incorporeal being who in no respect differs from the divine image, you will then agree that the name of the east has been given to him with great felicity. For the Father of the universe has caused him to spring up as the eldest son, whom, in another passage, he calls the firstborn; and he who is thus born, imitating the ways of his father, has formed such and such species, looking to his archetypal patterns. The word for “East” (anateile) here is also the word for “rising” (as in the rising sun) and this accounts for his interpretation of the son “springing” up as the eldest or firstborn. The first entity that is said to emerge or spring from God is the one who is given the divine name. This being is the (first-born) son of God, the image of God (and Man), and bears the name of God. The one who receives this exalted name is thus the son of God and a saviour figure. And all of this is found in Jewish thought prior to (or at least alongside of) the clear emergence of Christianity. Have decided to leave it off here and complete this in a future post. This is far more involved than I anticipated when I began. Posted on 2014-07-22 12:50:10 GMT+0000 by Neil Godfrey. This entry was posted in Christian Origins, God and Other Deities and tagged God, Israel, Judaism. Bookmark the permalink. Thanks for this. I’ll be looking more specifically at the name of Jesus in the next post. There is evidence for interesting ideas around the name of that famous foil of Jesus, too — Simon. It’s a tantalizing if elusive subject. At the risk of being reductionist, I’m tempted to read “name” as being very nearly, The Holy Spirit. The name seems very much like the spirit of God. Which is allowed to descend to/be applied to, various angels and human beings, who seem good and Godly. Thus giving them new authority and status. As special agents of God. Thanks to having received his Spirit. I might be wrong but I think “The Holy Spirit” as a person was a product of later Christianity, not Judaism. The name Jesus especially of course, would be important. The reference noted here would be the second time in Philo that we begin to hear, c. 20 AD, about a new “son of God” (Logos), then someone appearing anew under the name “Jesus” (or “God or Jehovah saves”?). Such new names, circulating in confused popular oral rumors, could easily have inspired popular notions that a new “son of God,” perhaps named “Jesus,” had appeared at about this time; c. 20 AD. Seems like this would form a significant part of the origin of the Jesus Legend. divine name, an angelic messenger”. Then again, assuming that each of the Gospels support the same Christology, is perilous. “ Richard Carrier isn’t right, and isn’t regarded as such. It’s dangerous to propose grand theories when you haven’t proven your ability to do the slog work on which valid theories must be built. Hurtado is letting the arrogance and rigor mortis of age get the better of him. I have seen this sort of reaction before among elderly professors looking down their superior noses on younger ones who challenge some conventional wisdom or introduce radically new insights. Hurtado is mostly rejecting the new wave of mythicist scholars. Still he is at least speaking with them. And now and then, we might be seeing a tiny bit of flexibility in the old professor and dean. He’s currently on the staff of a journal (JSHJ). His journal is primarily defending Historical Jesus. But his journal also includes many dissenting, rather mythicist articles. …And tread upon the earth and dwell upon it. Here, Enoch’s First Century BC or CE Jewish cultural context seems neither distant nor alien. This being so why is it supposed to be impermissible (e.g. for Bart Ehrman) to conceive “brother of the Lord” as something other than a familial, or blood tie?